So I’m sitting there watching Boardwalk Empire, and I think to myself, “I can do what Steve Buscemi does. He walks around, makes deals and maybe has to do a couple dirty jobs to tighten his grip on the organized crime of Atlantic city.” Omerta: City of Gangsters gave me the opportunity to step into these shoes and become ‘The Boss’ that I have always aspired to be. Sometimes in your life, a game comes around that changes your perspective on a genre. Omerta is not the game that is going to change your mind on the gangster simulator. However, it is the only modern gangster simulator that gives you the satisfaction of taking over Atlantic City piece by piece. The game starts with character creation, where both backstory and character stats are determined through a series of thinly veiled questions. What craftsman did you work with as a child? Well of course I hung out with the shopkeeper, which is displayed to grant 1 to cunning and -1 to toughness. I wanted the RPG elements to influence my play style throughout the game, but it really only factors in during the combat missions. Perks can be chosen to make you a skilled fighter or a better businessman, but I didn't’ find them to have a huge impact on the game overall. Once I was done with the quiz my newly formed character, Locke “The Stud” Vincent, was ready to venture into the underworld of organized crime. The game breaks down into two distinctly different phases. Most of your time will be spent in the city overview making deals, trading contraband, and developing the city. Why does every crime lord get into the business? The money. 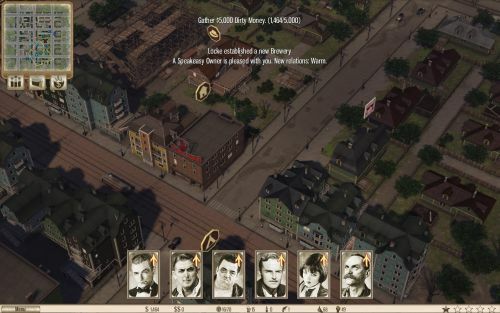 Everything in Omerta: City of Gangsters revolves around you making money, dirty or clean. There are multiple ways to make money, the most simple are by taking ‘jobs’ from NPCs around the city. These jobs are literally buying or selling beer, liquor, and weapons to a character portrait that you select from a menu. The other main way to make money is by starting up businesses around the map. The isometric view is nothing special, and does little to add to the experience but give you things to click on. Businesses range from underground boxing rings to pharmacies. The former bringing in dirty money and the latter giving you clean money. Both types of currencies can be spent, but the end goal for most missions is to attain a certain amount of clean money (which is more difficult to acquire). Businesses will bring in a constant stream of cash, as long as you have the production and goods to sell. Upgrades can be given to the businesses to increase efficiency, all with one goal in mind, to make more of that cold hard cash. Page created in 0.5271 seconds.